The legal marketing community has been abuzz in the last few days after Zach Lowe in the AmLaw Daily posed the question, "How Essential is a CMO?" following the announcement that long-tenured BigLaw CMO Ed Schechter left Duane Morris. Experts have weighed in, from Heather Milligan's dead-on comparison between an essential CMO and a non-essential CMO, and Mark Beese's list of five critical contributions of a top CMO. 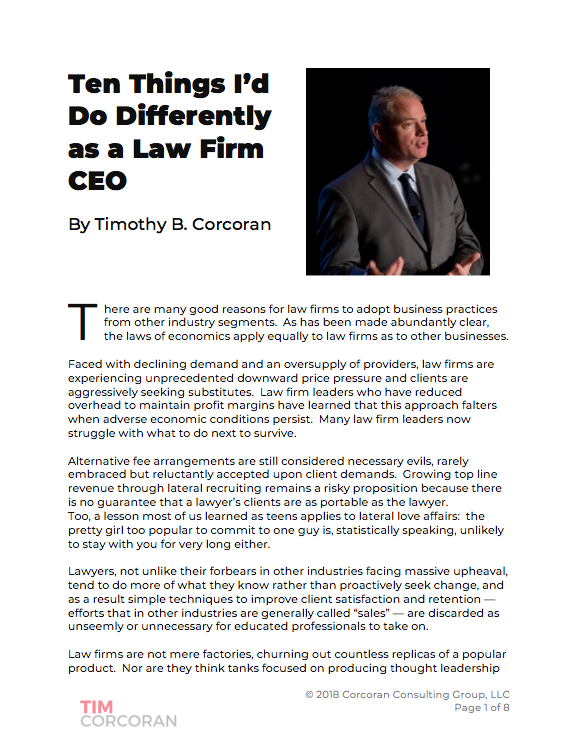 Indeed, in this space I have often challenged law firm leaders to take stock of their current organizational structure, adjusting not just compensation and staffing ratios, but finding new and innovative ways to deliver legal services in more cost-effective ways. Since a seasoned BigLaw Chief Marketing Officer is all-in a half million dollar investment, it certainly makes sense to question whether in today's economic climate this is a wise use of a law firm's capital. Like most good debates, there are multiple valid perspectives. A seasoned marketing executive can help a law firm differentiate itself from the pack. In a world where every law firm claims to be big but offers a personal touch, represents big corporations to small businesses, values diversity, is client-focused and offers leading expertise in dozens of practices, one can readily see the value in standing apart from the crowd. Don't believe me? Visit Ross Fishman's Automatic Brochure Generator and tell me if it's indistinguishable from your firm's own copy. A seasoned marketer can help define the optimal client footprint, i.e., which work do we enjoy, that is profitable, in growth industries, with clients who have needs that span our practice and office mix. Instead, most of the many firmwide and practice group marketing plans I've reviewed tend to fall into the "We'll chase all new revenue" category. A seasoned marketer will be able to distinguish between building awareness and generating business, and therefore offer tactical support to move prospects from a wish list to an active client list. Nearly every marketing plan I've observed includes at least one "unicorn" statement (referring to my daughter's wish for a unicorn on her 3rd birthday): "We hope to increase revenue from key clients and prospects in our target markets." This is essentially useless. What it really means is "We hope the phone will continue to ring as a result of worldwide demand for legal services, despite our inept approach to business generation." Good marketers don't traffic in unicorns; they take actions and build processes that are designed to generate revenue. A seasoned marketer will build an operation that performs the above tasks, and many more, in such a way as to optimize the competing constraints of speed, quality, subject matter expertise, available resources, time zones and, shall we say, partner importance. It's a poor operation that merely reacts to whoever is shouting the loudest at any given moment. So why don't law firms rush to hire experienced professional marketers? And why are many eliminating, or considering eliminating, those they have in place, or delaying replacement hires? It's as simple as BigLaw leaders not understanding the revenue-generating impact of a good CMO. But the legal marketing community isn't blameless either. Many of our most senior marketers are hesitant to embrace the financial aspect of the role. Measuring return on marketing investment is difficult even in the corporate sector, and BigLaw poses additional challenges because annual budgets are a relatively new phenomenon, partners often have great latitude in spending "marketing" funds and expenditures are typically viewed as one-time debits to cash flow and profits rather than investments with multi-year horizons. As a result, many senior marketers are thankful they aren't given budget responsibility and don't contribute to revenue forecasting when in fact this is a glaring omission. BigLaw partners operate under the amusing notion that a flat governance model in which every partner is an equal owner with equal authority is somehow a rational business choice, when in fact it's an inefficient, extraordinarily dilutive and disruptive structure that persists due to inertia. To be clear, the partners can organize their sandbox however they want, but this scenario rewards senior marketers who have learned to please partners above advancing the financial interests of the firm. Indeed, there are countless examples of experienced marketers from other disciplines stymied by the bizarre world of BigLaw. As one CMO put it to me without irony, "Success in a large law firm is all about credibility, which means accepting that we don't often do things the right way, we do them our partners' way, but after about a year of serving their needs you should have built up enough credibility to gently make suggestions, most of which they'll discard, but to survive you can't try to do too much too quickly." And let's not overlook the recruiters in the field who specialize in moving around the same players, or at least the same skillset, because it's the safe approach to placement. I've been approached more than two dozen times for law firm CMO roles and each recruiter plays some variation of the same tune: "This firm is not like all the rest. They have good practices, with loyal clients, and very few toxic partners. They don't need a change agent, what they need is someone to keep the trains running on time. They hired someone in the past who spent a lot of the partners' money (on restructuring, branding, CRM, advertising, or whatever) so now they really just want someone to maintain what's in place." Or as one BigLaw leader euphemistically declared, "We're picky and we're looking for the perfect candidate." All businesses need a continual focus on identifying targets and pursuing opportunities. While a law firm shouldn't mimic a traditional corporation in all respects, recent events aptly demonstrate that BigLaw leaders who confused high demand with business acumen should now seek expert assistance to help them create demand. BigLaw leaders need to discard the outdated notion of the role of a CMO, hire experts who know their craft, and give them air cover to inform the debate and drive positive change. Legal marketing has come a long way but still has opportunities for growth. The old formulas valuing longevity and loyalty and keeping the peace should make more room for financial acumen, forecasting and planning, business development and executive presence. To be sure, people skills are always important, but let's find a way to solve for financial success rather than merely keeping partners happy. We don't all have to get along. But we do have to recognize that long-needed change is afoot, and with change comes discomfort -- and this applies equally to BigLaw leaders and legal marketers. Indeed, in my prior corporate life some of our greatest successes came only after forceful debates and significant disruption. The economic downturn has already provided the disruption, so let's not let it go to waste.